I haven’t baked anything interesting in awhile, but given that the poet is out of town and it’s the start of my spring break, I decided to go all out. I’m also celebrating going to graduate school for sure (just got accepted to Hollins University’s MFA with a full tuition waiver and a full stipend), and although I’m not certain I’ll end up at Hollins (still waiting to hear back from the other programs I applied to), it’s certainly a reason to celebrate! 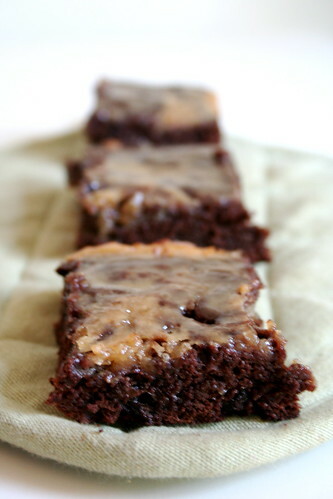 When Peabody posted a recipe for Bailey’s Irish Cream Cheese Swirl Brownies I knew I had to make a vegan version. I’ve never been too good at making brownies–I always make the batter too oily or too thin or too thick, but I decided to try my hand at it again. I tweaked the Joy of Vegan Baking’s recipe and Peabody’s enough that I feel fine posting it here. These brownies are killer. They are a serious indulgence. And I plan on making them again. Dark, moist, not too sugary, definitely Kahluaey, they define everything I’d ever want a brownie to be. I can’t wait to get back to my house after work tonight to eat another! Preheat the oven to 350. Oil a 9×13 pan. In a medium bowl, cream the vegan cream cheese, Earth Balance, and sugar with a hand-held mixer (or use an upright one, if you have it). Add the flour, apple butter, and Kahlua. Once smooth, set aside. In a large bowl, mix the sugar and apple butter. Add the ground flax seeds, water, and vanilla. Once combined, add the remaining 1/2 cup of water. Slowly stir in the flour, cocoa, baking powder, and salt. Once the batter is smooth, stir in the chocolate chips. With a spatula, spread the brownie batter evenly in the pan. Spread the cream cheese mixture on top of the brownies. Use a knife to swirl the cream cheese into the brownies. Bake for 35-40 minutes, or until an inserted knife comes out clean. Let the brownies cool for 15 minutes. Meanwhile, in a small bowl, mix the powdered sugar and Kahlua together. If the glaze is really thick, thin with soy milk. Using a pasty brush, brush the glaze over the cooled brownies. Allow to cool another 15 minutes, then slice and serve! A good tweak, I considered using Kahlua as well. I need to make them that way now too! Congratulations on your acceptance! Even if you don’t wind up going there, it is indeed something to be very proud of. As are those brownies! Holy chocolate gods, they look decadent. Mmm, those sound delicious. I love desserts with Kahlua in them, especially brownies. you are my hero. this rocks. Congratulations on accepted to Hollins!! Celebratory brownies are the way to go! They look beyond delicious and super chocolaty! Thanks for the birthday wishes! I’ve been away from Blogland for a couple of weeks and now I’m trying to catch up on all the blog reading. Welcome to the goat adoring club! Congrats on the full ride! That is so awesome, maybe they will get into a bidding war! The brownies look terrific! Amazing – I had the weirdest urge to bake brownies this morning (it’s weird because I very rarely spontaneously make a dessert) and this looks awesome! And congratulations on the acceptance and full ride; even if you don’t choose Hollis, that’s fantastic! I drooled over Peabody’s version and now I’m drooling over yours- I’m so happy that you veganized the recipe, it sounds fantastic! Those look amazing. And congrats on grad school! Congrats on Grad School! It’s such a relief when that first offer comes in – even more fun to pick! I am drooling all over myself, so I’ll go mop that up now – yum! Kahlua brownies – oh god yes!! That sounds amazing! Congratulations on your acceptance and good job on the brownies! Congrats!! And these look amazing. So amazing that I would NOT share with my squirrels unlike last week’s cupcakes..he he he! Oh wow, these look over the top amazing and delicious! Congrats on the acceptance! Awesome, decadent and devilishly enticing, Jes! I need to go out and get a new bottle of Kaluha. You have a great reason to celebrate with these — congrats! what a great way to celebrate! congrats to you! congratulations on hollins! that’s so great! and these brownies you speak of…wow. just…wow. I would die for one of these, with a frosty pint, oh my…. mmm i make really good (vegan) cream cheese swirled brownies… maybe i’ll post them sometime. omigod…I’m drooling all over my keyboard. this looks amazing. also, you take great pictures of your food, do you mind me asking what kind of camera you use?